The sound of The Beatles was molded by many factors. The quality of the technical staff at EMI Recording Studios (more commonly known these days as Abbey Road), great microphones, the hand-built and custom-modified gear used on the sessions, and the preferences of the balance engineers that were responsible for getting the sound on tape. When it came to bass, obviously, both the instrument selection and amplifier selection were also critical. This article will focus on McCartney’s bass sound during the “Sgt. Pepper’s Lonely Hearts Club Band” recordings in 1967. I’ll describe McCartney’s rigs, how balance engineer Geoff Emerick recorded the bass and why he made the choices he made. Then I’ll describe how you can replicate this sound for your recordings and mixes, using affordable microphones and plugins. 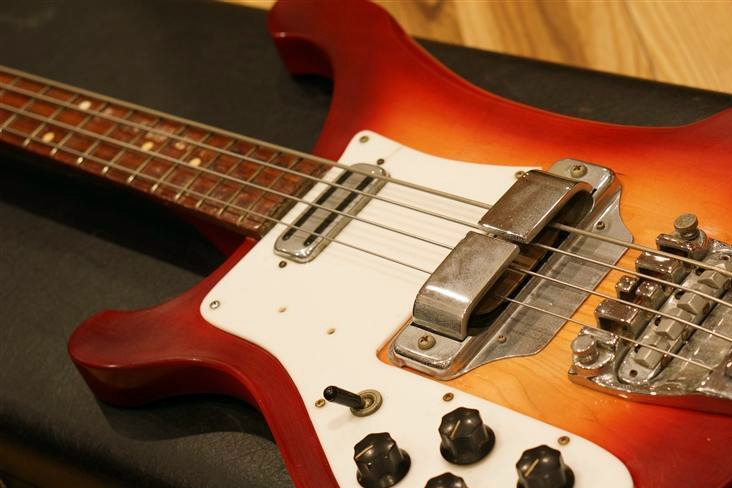 McCartney performed his bass parts on his 1964 Rickenbacker 4001S bass. He had two amplification options available: a 50-watt 1963 Fender Bassman 6G6-A (Blonde) amplifier with cabinet. The cabinet contained two, 12″ Jensen C12N or Oxford 12M6 speakers; or the 30-watt 1966 JMI Vox UL430 Bass amplifier with cabinet. The cabinet contained two, 12″ Celestion G12 speakers. Sorry – make that three. On the song “With A Little Help From My Friends”, he didn’t use either of the previous amplifiers and cabinets. Instead, he uniquely played through the studio’s monitoring rig – an EMI RS141 Leak TL/25 Plus amplifier with an Altec 612 speaker cabinet! Geoff Emerick liked to blend multiple microphone sources to achieve some of his sounds, perhaps a lesson he learned from The Beatles first balance (or lead) engineer, Norman Smith. For bass guitar, he used a combination of the AKG C12 as a near-cabinet mic and the STC 4038 as an ambient mic; placed about 8-feet away from the cabinet. Outboard gear was precious at EMI. Commonly only a couple Altec compressors and Fairchild 660 limiters would be used for an entire session. Rather than inserting the gear on the input channel of the sound, they would be inserted on the console’s output to the tape machine (post EQ and fader). The compressor of choice during this era was an EMI-modified Altec 436B, dubbed the RS 124. Emerick’s choices centred around control of the bass tone and dynamics. The use of two microphones (sometimes one microphone and direct injection [DI]) allowed him to get the right blend and atmosphere. The C12 was a condenser microphone, while the 4038 was a ribbon. The compressor smoothed out the dynamics, and in a period where McCartney’s bass work increasingly utilized the upper fretboard, allowed those notes to be as present as the more common low frequencies. You can get McCartney’s “Pepper”-era bass sound today, and it doesn’t have to cost you an arm and a leg. There are a few key takeaways that I was drawn to when my client asked me to recreate the sound. First off – the amplifier cabinet. Note that McCartney’s bass rigs used 12” speakers, not the 15” (or larger) common to modern bass players. This might mean having your bass player use a guitar cabinet for their work. Next, I want you to forget that the AKG C12 is an expensive condenser and the STC 4038 is a fragile ribbon microphone and instead think about the fact that Emerick used two different microphones, each with their own character and placed so that one was direct and the other ambient. Maybe for you that will mean a condenser plus a dynamic. There are several affordable options in these categories. Lastly, when it comes to processing the work in your DAW, remember that Emerick was forced to insert his compressor last in the chain before the signal hit the tape machine. The two microphones had already been balanced, summed and then equalised. This routing is easily replicated in the recording chain. When mixing, I handle the chain by using two input channels for the microphones, balancing them for volume, and then sending them to a bass auxiliary channel where I add my processing. Of course, I have more processing options than Emerick did, so I run the signal through trim, corrective EQ, a Waves REDD console emulation, 1176 compressor (the closest I have to the 436B), some final balancing with a Waves MV2, then to tape emulation, and finally some final harmonic enhancement with the Waves NLS channel (using the TG preset). Do you need all that? No. Do you need Waves plugins? No. Remember, the concept is the important thing: Sum the mics, EQ, compress, followed by tape saturation/harmonic enhancement. Those are the key elements. Knowing the gear and formula that Emerick used to track McCartney’s bass is great information, but maybe my most valuable advice on bringing any classic tone to life is to use your ears. Put a reference track in place, analyze it and think about the tools and limitations of the era in which it was created. You probably already have a bigger toolkit than those engineers ever dreamed of!